Frank Gossner is a bit of a legend. Frank’s been digging for rare afrobeat, disco and funk in Africa for a while now. And when we say digging, we mean really, really digging. Not just hanging out at record shops, thumbing a crate. We’re talking putting ‘Wanted’ posters up on telegraph poles, knocking door to door, even climbing through 10 metre high piles of vinyl to get the track he wants (see pic!). And when he finds what he wants, he DJs it out to salivating crowds worldwide, posts mixes on his Voodoo funk blog. and puts together great compilations of rarities. 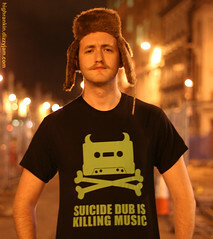 And now he also makes Voodoo Funk t-shirts, with a little help from us. Visit his shop to grab one! Update: Featured on The Guardian blog. Update 2: If you’re in the independent music sector you can still contribute to this important survey. It will take about 60 seconds, and we’re giving out prizes. Click here! A survey of over 200 independent musicians, DJs, producers and bands found that while record sales are down, they are making up the shortfall through merchandise and live performances. However almost a quarter (23%) actually lose money on their musical endeavours, and less than five percent of them made a living. 72 percent reported making a small profit, but not enough to live on. While for those of you actually busting a gut in the music industry already it may be a case of “no sh1t, Sherlock!”, we think it’s very interesting to finally put some figures on what we kind of already suspected. And as we enter the digital age, and Prince gives his CDs away for free with newspapers, the importance of downloads becomes clear with more than a third (34%) claiming to make more money from downloads now than 2 years ago, and 23 percent reporting physical sales down over the last 24 months. What’s interesting, however, is that there appears to be an upsurge in live music, with a third (33%) reporting making more from gigs than they were two years ago. The study, conducted by Dizzyjam.com, has highlighted the importance of merchandise and touring to bolster dwindling incomes across the independent music sector. In its first few months of trading, Dizzyjam.com has sold t-shirts and hoodies on behalf of musicians across four continents, by providing a simple and free route to market for people who make, play or promote music. Many bands are making hundreds of pounds a month already which they are putting towards studio time, promotions and equipment. Or just simply paying the rent. They’ve seen a 42% increase in signups in the last 3 months as bands look to increase their income. 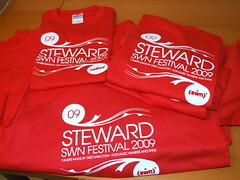 The Cardiff, UK based company allows members of the music industry to upload their logo to the site, which in turn creates for them their own online shop with products featuring that image. Dizzyjam.com is the brainchild of Neil Cocker, recently noted as one of Wales top young entrepreneurs, and Dafydd Griffiths, former key staff member at the world’s oldest record store, Spillers. 207 people were questioned as part of the survey. 82 percent were from the UK, 12 percent from North America, 4 percent from Europe and 2 percent from Australia. 71.8% reported that they made some money, but not enough to live on. 23.2% reported they lost money through their music endeavours, with 4.3% reporting making a living through music. The remainder didn’t answer the question. Actual incomes weren’t recorded. Music Supported Here is a new movement from the Musicians’ Union. It’s a campaign for all musicians. It’s about the simple but important principle that musicians should not get ripped-off in the digital world. Neil from Dizzyjam was asked to write a guest blog for them. He wrote about the importance of maintaining quality in everything you do, not just in your music. When merch, and live performances are earning you more than MP3 sales, you should definitely be giving them your full attention. Buy your way into the charts! Well, that seems to be the premise. New company Chartfixer promises to get your track into the charts. But at a cost. They claim to legitimately achieve this paying its users to download your tunes, which you obviously stump up for. I wonder how long it will take the various chart organisations to ban this? Or is it a fair way to play the system? Update – Chartfixer appears to have closed down. Seems like it didn’t take long for the authorities to take action…. Here in Cardiff we recently had an amazing TEDxCardiff event with loads of great speakers. One talk stood out for us, and one that should be of interest to all our readers. Dave Haynes is the UK head of Soundcloud, a brilliant service for music makers everywhere. We love it, and Dave’s a really nice guy too. Ellie Goulding as a mouthpiece for X-Box? We were invited along to the X-Box Reverb-sponsored Ellie Goulding gig a few weeks ago in Cardiff. It was in the recently opened Cardiff Arts Institute. Despite having reservations over the way the campaign had made several venues campaign against each other to be the “chosen” venue, potentially driving divisions in a scene small enough to be more unified, it was interesting to watch the buzz swell on Twitter and other social media channels. We arrived, greeted by a large promo team shipped in from London to grinningly sign people in and ask for their Twitter passwords so that they could tweet what a great time they were having on their behalf every time they passed a special digital “keycard” over several hotspots scattered around the venue. Alongside this, they’d brought in tens of thousands of pounds worth of X-Box consoles, flatscreens, and AV equipment to make this a gig that Cardiff Arts Institute would possibly never see the like of again. For a venue that can hold just a few hundred people the likelihood of a local promoter being able to spend this kind of money on production is infinitessimally small. found. It essentially detailed all the things that golden girl Ellie Goulding should say about X-Box when speaking to the press. It was media training on a single side of A4. “XBox is the home of great music experiences, along with great music games like Beatles Rock Band and Guitar Hero. You can also download 100s of music videos on XBox Live”. “XBox 360 is more than just a games console – it’s an entertainment hub where you can enjoy great music, movies and of course games. Not to mention connect and communicate with your friends and family wherever they are”. “XBox Live opens you up to a world of great entertainment simply by plugging your XBox 360 into your broadband. Play, watch and connect with your friends”. There then follows some press gumph about XBox and XBox Reverb (their music community brand). We made a copy of the original piece, and then handed it over to a journalist friend of ours. He later questioned some of the promo team about the document, but they immediately confiscated it and refused to return it. Boo! While we’re completely open-minded about artists working alongside brands if they feel that’s a legitimate means to an end, and a way to reach their fans, we’re distinctly uncomfortable about them becoming mouthpieces for the brands. Is it too much to expect an artist to regurgitate marketing copy of a product they’re affiliated with, despite the fact that this is increasingly becoming a legitimate means of gaining exposure for your music? Are you happy with the level of influence that brands are now starting to have over the acts they’re associated with? Or is this no different to them being signed up to advertise a product in the same way that Hollywood actors do with coffee, aftershave, cars etc….? We’re teaming up with Storm The Charts to raise money for charity – Storm The Charts is an fantastic, ambitious grassroots campaign to get 40 different unsigned bands into the top 40, all in one given week. We’re pleased that here at Dizzyjam we’ll be supplying the official t-shirts, and any proceeds from both us and Storm The Charts will go to EDGE, a zoological charity that specialises in the conservation of ‘Evolutionarily Distinct and Globally Endangered’ species. BUT…. We don’t have a design for this t-shirt, and that’s where we’re throwing it open to you: send us your Storm The Charts designs: you can follow their current flag-style logo, or you can go off on a tangent (as long it’s a good-looking tangent). It’s a one-colour design, and you’ll have to follow our design guidelines here and ideally you’ll get it to us by Sunday 7th March Sunday 14th March as time is tight, and the sooner we get it for sale, the sooner we can start raising money for charity. Send your finalised designs to stormthecharts@gmail.com where they will pick a winner. Examples of designs that work with our process are here, here and here. Get going, and get raising money for those strange and beautiful animals! Try saying that 5 times in a row…. 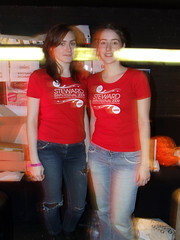 We were very proud to be one of the sponsors of last year’s amazing Swn festival. We printed these amazing shirts for them, but we have a couple left over that we’d love to let you guys have for free. There’s ten in total, all in a fetching red, and we’ll give them to the first ten people to contact us here, remembering to tell us your size and whether you’re a male or female. And don’t forget you can buy a “normal” Swn t-shirt from their Dizzyjam shop. UPDATE: We have no men’s t-shirts left, sadly. We need more women to ask for free t-shirts! 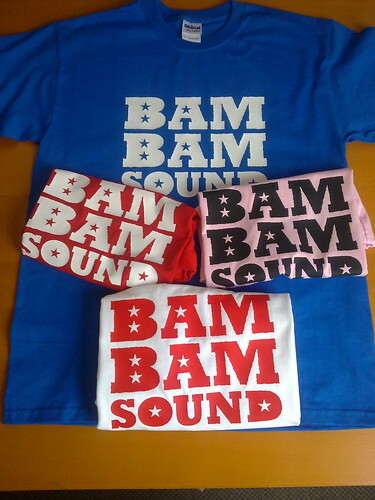 But if you make or play music you should still click here to find out how we can help you sell t-shirts to your fans. UPDATE No.2 – We only have ladies medium or large left! Yes, that’s right people. The musical collaboration we’ve all been dreaming of, and praying for, is finally happening. Jedward are teaming up with Vanilla Ice. You heard it here first. Unless you read this link with all the details before you heard it here, of course. Can you hear my shirt? It’s a t-shirt with a brilliant soul playlist on it, that you can listen to via Spotify here. And you can buy it here.